You’ll love this easy IKEA hack Makeover that transforms an affordable piece of furniture into an expensive looking sideboard with a couple cans of stain and a Step by step guide. Hello there! Susan here from Kindred Vintage and I would just like to start off by saying how thrilled I am to be guest posting here at Lolly Jane Blog today! Since day one of discovering Kelli and Kristi on Instagram I have adored their energetic, fun personalities and their colorful creativity! Needless to say I am so grateful for the opportunity to share how I redid our IKEA Norden sideboard makeover with you! (NOTE that this sideboard table hasn’t since been discontinued but this tutorial can be applied to any IKEA piece of the same finish.) I am so pleased with the way it turned out and how it went from any ordinary to a piece of IKEA furniture to one with loads of character and charm. A short bit about myself some of you may know me through the Instagram community, some of you may not but nonetheless, my name is Susan from Kindred Vintage. I am a stay at home momma, a wife to one of the most wonderful man in the world and a mother to two of the most darling little girls. I adore my family, good friends, coffee, vintage goods, decorating, red wine and being surrounded by beautiful spaces. 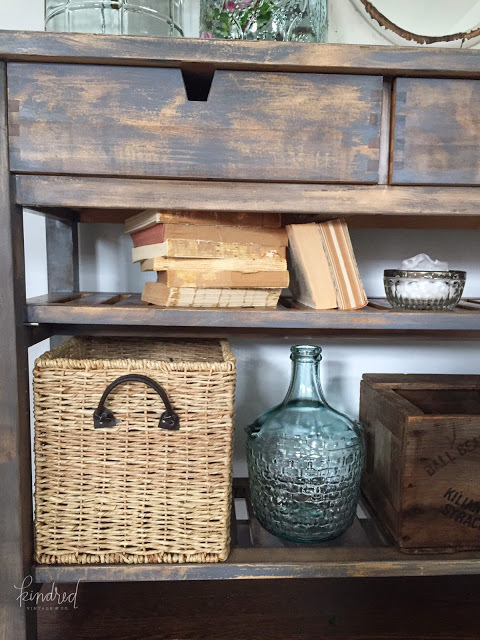 The thrill of the thrifting hunt, finding that imperfectly perfect piece and giving unloved gems beautiful new life has always been a passion of mine. I enjoy adding character to spaces through unique furniture and mixing the old with the new. The motto I live by; fill your home with only the things that you absolutely adore, because in my opinion, those things represent you and that is what truly makes just any old house a home. 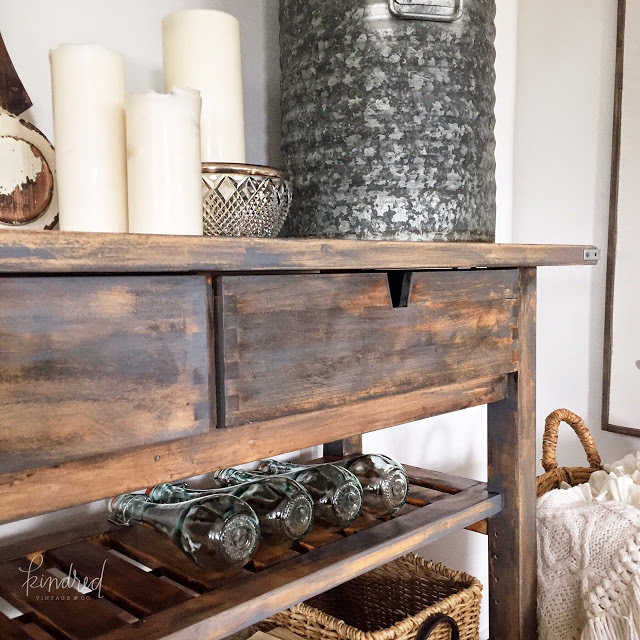 Today I’m going to share my latest DIY project that transformed our Ikea sideboard from ordinary to rustic chic. Here’s the before picture of this easy Ikea hack. The process was fun and easy! 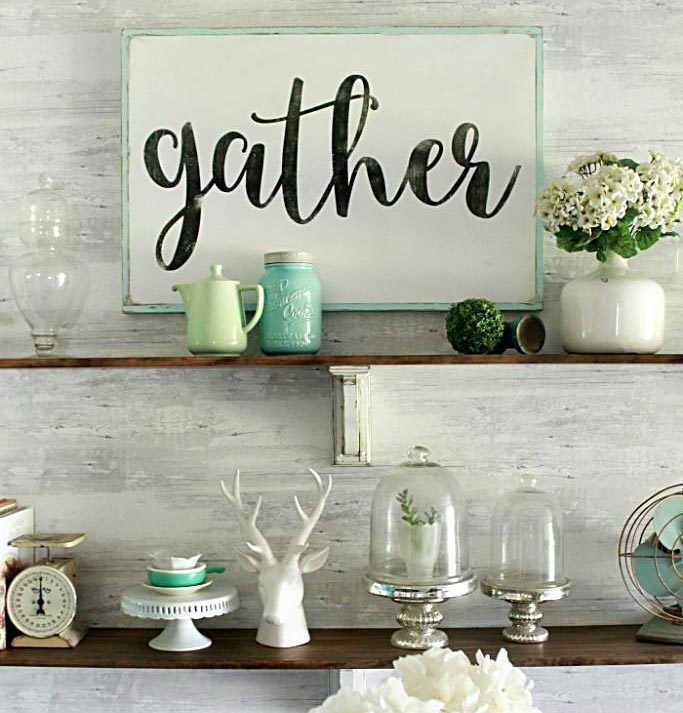 It can be replicated on any raw wood surface, too. If you’re looking to recreate something similar, simply follow these steps. Please note some of these links may be affiliate links. That means we may make a few pennies per dollar at NO added extra cost to you! Sand down wood to get off any old stain or finish in order to make the surface smooth. Apply Dark Walnut Stain with your cotton rag making sure to coat the entire surface. Wipe off excess with paper towels. Wait two to three minutes for stain to settle in. Wipe down sideboard with a rag to take off any access stain. 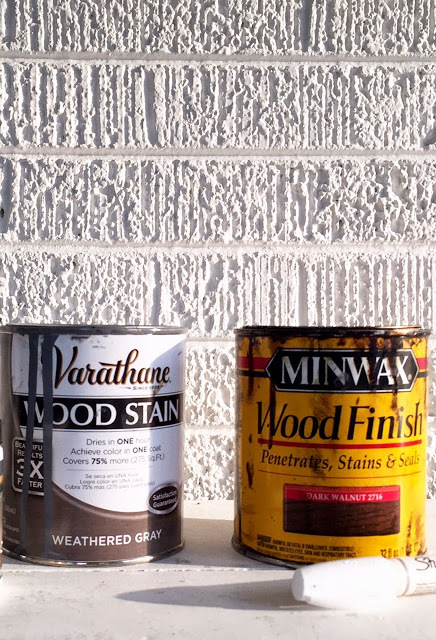 Apply Weathered Gray Stain with your rag, on top of the dark walnut stain you just applied. Applyn as little or as much as you would like, depending on how weathered of a look you are going for. When you have achieved your preferred look, let the stain dry for a few hours before waxing. Once the stain has completely dried, apply a liberal amount of clear wax to the sideboard. Screw on L brackets to the corners of the table top to add some decorative flair. PLEASE PIN so your friends can stain Ikea furniture darker, too! Gorgeous look for that Ikea table. I really love this whole look. We are IN LOVE with this too! Susan is so talented! Absolutely love this transformation! I am obsessed with Ikea Hacks and you completely nailed the look of this one! Well Done Susan! This looks awesome Susan. You did a good job . Thank you Kelli and Kristi for sharing this. Have good weekend. Wouldn’t you know it? I finally see something wonderful I HAVE to get at Ikea, and they say “Sorry, this is going out of our range. Find an alternate product.” GRRRR! LOL. Love what y’all did to this sideboard. I’ve been looking for something like this for several years now for my vintage remodeled bungalow. Try Craigslist ….I just found one asking 99. Instead of the higher price. Hi! I LOVE your blog!!! So thankful I found it! I have never done a DIY project and am gonna try to do this one since I have this norden sideboard! I went to the store to get all the supplies but wasn’t sure what grit of sandpaper to get? I am a total newbie and am completely clueless! How much did you sand this down? Love your style and am going to be an avid follower from now on!! I have been looking for something like this for my entryway. Love it!! Can I ask where you purchased yours from? where are your pink flowered from?!?! Just found you through Pinterest. Love this!! Thank you for sharing! 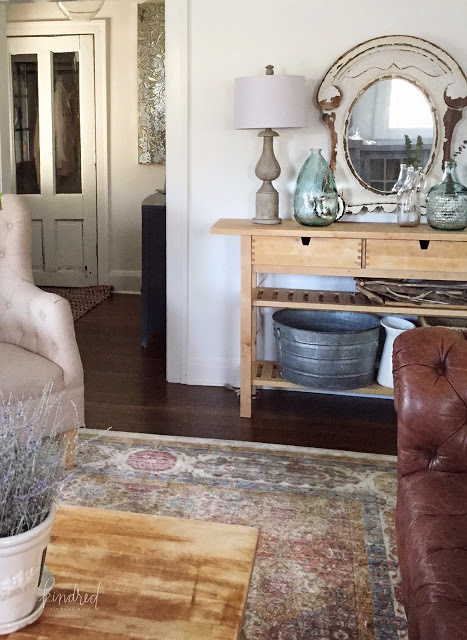 Could you tell me where you purchased the beautiful area rug in front of the Ikea sideboard? 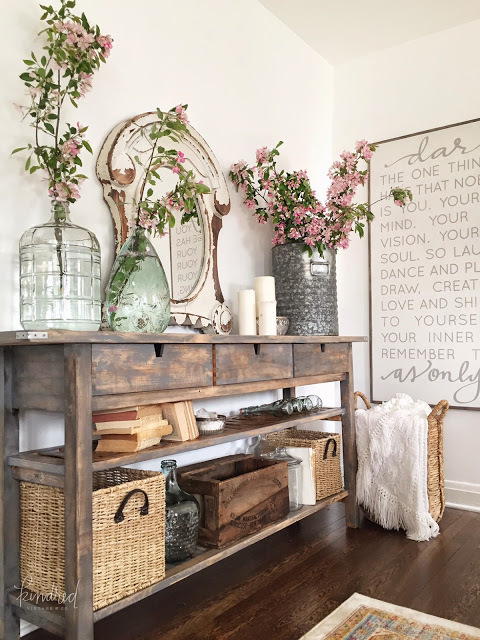 I love the entryway table. Can you tell me where you got it? I love what you did with the stains. Love this!!!! I love this! I couldn’t find this sideboard on the IKEA website. Do they still sell it? The mirror… I’ve seen it a hundred times but can’t figure out where to get it! I love your project! Hi Ladies, love, love, love what you do! 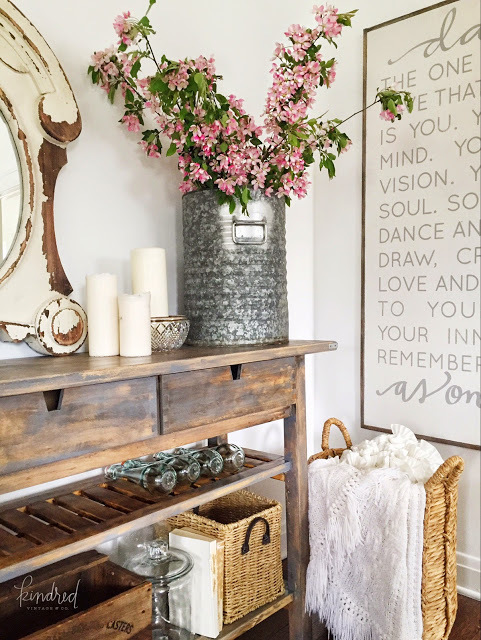 Also love those beautiful word plaques and canvasses, was trying to read all the beautiful inscriptions….where are these from or did you create your own…would love to see the one that starts with dare….! Are you freakin’ kidding me?? That is gorgeous!! Thanks for sharing. Maybe it’s a different one? This model has since been discontinued, bummer! I love the piece and the mirror.Where can I get a mirror like this? I love all the glass and metal pieces you used for vases. Where did you find them?? I absolutely love this! 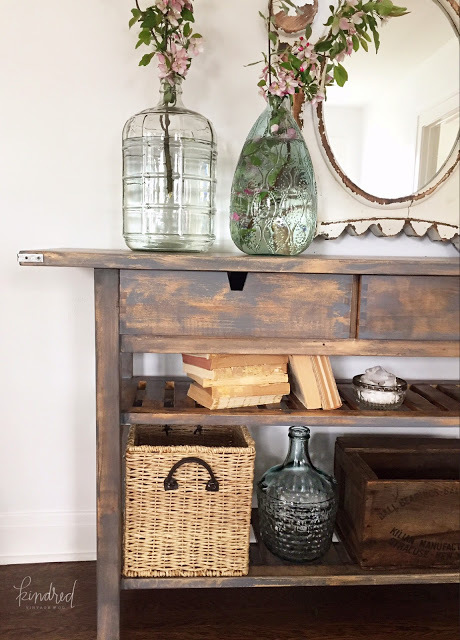 I’m having a farmhouse console table built and decided I want to stain it myself so I’m sure to get this weathered look. When you put the dark walnut stain on, did you do it in sections (i.e, top first), then put the gray on that section, then going onto another section to do the same thing (next shelf, legs etc) or did you do the whole table at one time with the walnut, then put the gray on the whole table? Just want to make sure I do it right. Also, any extra tips on how to do this for a newbie? Thanks a bunch! You’ll put the dark walnut stain on first, then wipe it off. After 5 minutes, repeat with the gray. I would definitely do it in sections like you asked, due to dry time 🙂 We’d love to see your after pic! Does the IKEA Norden Sideboard have actual drawers in them or boxes that just sit in them? I’m having someone make it because IKEA doesn’t sell this sideboard anymore and they were asking me it has actual drawers. Thanks! 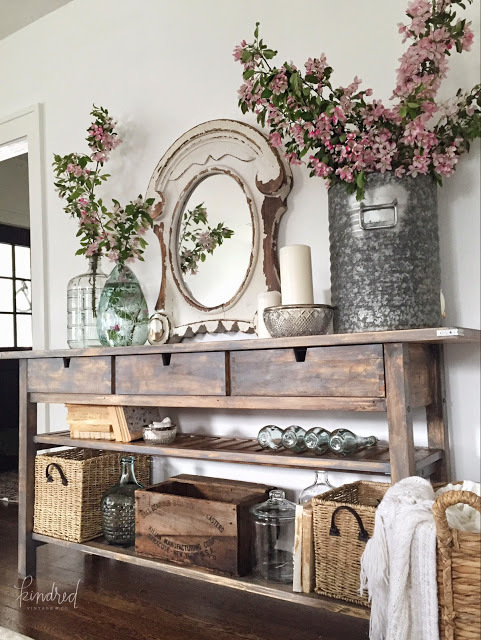 I’ve admired this sideboard for a few years now and I especially love how you stained yours. I have looked and looked and looked on ikea website for this and all they ever have is the one with two drawers. Do you have to call them and order this? Are you in the U.S.? Maybe they don’t have it here but I love it and still want this and want to try to find a way to have it.